This stitch pattern has a little drape, but would have more in a DK weight. 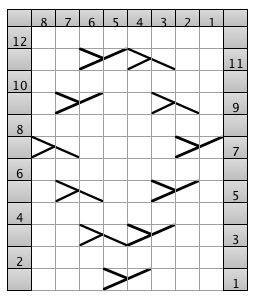 It's a nice geometric pattern that also has diagonal stretch. *For using this stitch pattern in a garment, that will have a seam, it's advisable to add an extra stitch at each edge. There really is no (WS) stitch for the cross stitches. They show up as a purled, embossed diamond. But the program does not have a reverse stitch to use. *On the 1/1lbc, you need to knit through the front of the 2nd stitch loop BUT do it coming from the back. 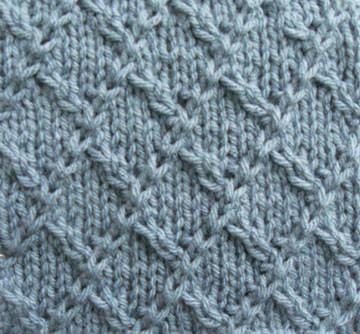 Leave it on the left needle, Knit normally through the 1st stitch, and then slide both to the right needle. 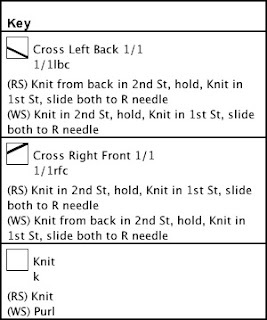 On the 1/1rfc, knit normally into the 2nd stitch, leave on the left needle, knit normally into the 1st stitch, and then slide both to the right needle.